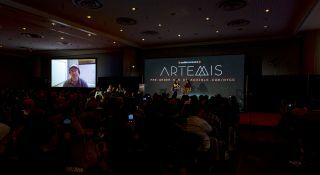 Actress Rosario Dawson (right) and moderator Jada Yuan of New York magazine discuss Andy Weir's new novel "Artemis" and its audiobook (left, on Skype). NEW YORK — When actress Rosario Dawson agreed to voice the audiobook for "Artemis," Andy Weir's follow-up book to "The Martian," she hadn't realized she'd have to portray every character in the novel. "I actually had it in my head that I was just going to do the narration," Dawson told a large audience at New York Comic Con on Oct. 5. "That's what I thought I was being hired to do; I was just going to narrate it, and then they were going to have all these other people read all these other things, and I would do [the main character,] Jazz." "I'm doing all these accents, and it was this most remarkable experience," she said. "I wonder, had I known how much it was going to be, if I would have said yes — but I'm really glad I did." The novel will be released Nov. 14, and Dawson was at Comic Con promoting the audiobook by Audible, which will be available the same date. (A giant, glowing moon exhibit also helped promote the audiobook that weekend.) Dawson shared the stage virtually with Weir himself, appearing via Skype — he proved he was in California, not the moon, by dropping a pen — which fell down under the influence of Earth's gravity, rather than more slowly under the moon's. "Artemis" follows Jasmine "Jazz" Bashara, a young woman who works as a porter (and smuggler) on the titular lunar city, a tourist destination divided into four big spheres named after Apollo astronauts. The cover for the audiobook of "Artemis," by Andy Weir, available on Audible. "Each bubble is this big air-pressure vessel; it's a sphere that's half underground and half aboveground," Weir said during the panel discussion. "The big ones are 200 meters [656 feet] across, and the small one, Armstrong, is 100 meters [328 feet]. It's a double-hulled system. So there's 6 centimeters [2.4 inches] of aluminum, a meter of crushed lunar rock, and then another 6 centimeters of aluminum — and then air pressure inside, where all the people live." Each sphere has its own distinct purpose, he added: "Armstrong is industry, Aldrin is the tourist center with casinos and hotels and stuff, Conrad is where the blue-collar folks live, the low-income people. Bean is sort of like suburban life; it's middle-income folks. And then Shepard is where the really rich people live." There's also a separate spot, accessible by train, where tourists can see the Apollo 11 landing site. Weir said he based the system's economics on resort towns; Jazz, who grew up there as the daughter of a welder, is one of the blue-collar people who live there permanently and know the city inside and out. "I was really drawn to Jazz herself," Dawson said. Like "The Martian," her story was "sci-fi, but the kind of sci-fi that's really tangible, and even though it's incredibly technical, [it's written] really beautifully in layman's terms, in the sense where it really translates, and you feel like you're really there," she said. Jazz has "the types of instincts she has in a scuffle or whatever that someone who's coming from Earth wouldn't necessarily have, because how you would move and jump, and how you would use your environment around you, is so transformed," Dawson said. "She's incredibly sharp, and it was really empowering to pretend to be this person who could manage so many different situations — [she] just felt like super MacGyver!" Weir's first idea for a story set on Artemis was very different from what he finally settled on, which incorporated an "Ocean's 11"-like plot for the science-fiction world. "I've always loved crime capers — I've always liked caper stories, heist stories," he said. "And, of course, I'm a sci-fi author, so I figured, well, '¿Por qué no los dos?' [Why not both?]. I want a crime caper that takes place on the moon." Dawson and Weir discussed the way the plot draws on technical details of the off-world setting. For example, Dawson particularly enjoyed details such as flammable objects being considered contraband due to the fire risk and the special considerations Jazz took when moving about in lowered gravity with a different mix of elements in the air that fleshed out the story's location. "It reminded me a lot of scuba diving," Dawson said. "When you're underwater, there's this totally different pressure, there's a totally different reality and the things that you would normally do, you just can't — your instincts are completely wrong, and you have to adapt to that new environment. "I loved how so much of that very technical information was expressed … through those situations," she added, noting that the movie version, which has been approved by Fox, would be an ideal format to bring the very visual aspects of Artemis to the forefront. The duo also took some non-"Artemis"-related questions; they discussed their fascination with science fiction, why they enjoy comics and the connections between science and culture. When asked what off-Earth location they'd like to visit, Weir had a quick response: "Bear in mind, you'll die immediately," he said. "I guess the center of the sun, so my suffering would be minimized." "I'd actually like to go to Saturn," Dawson said. "It's so beautiful, and I just love that idea. We have our own ring of garbage that we have going around our planet; if I could navigate out of that debris, I'd like to get out there and see it."